Figure 1 --The location and layout of the constellation Triangulum. The position of iota Tri, NGC 752, and M33 are also indicated. It's not much to look at, but the ancient constellation Triangulum is a worthy stop on any tour of the autumn stars and constellations. 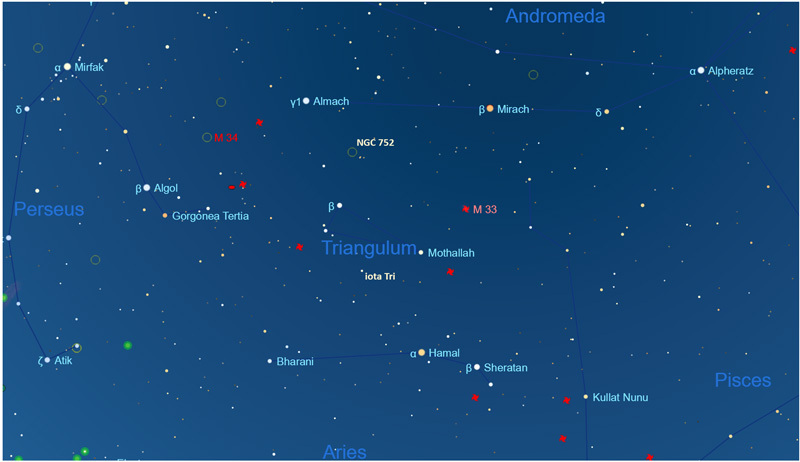 Situated about 10 degrees due south of the star Almaak (γ Andromedae), Triangulum is a small, dim constellation, the name of which, unsurprisingly, is Latin for "triangle" because of the layout of its three brightest stars (see Figure 1). The stars beta and gamma Trianguli, magnitudes 3.0 and 4.0 respectively, form the base of the little triangle. Alpha Trianguli, at the apex, is a star of magnitude 3.4. The shape of this little constellation caused ancient Greek stargazers to link it to the Nile Delta, while Roman stargazers likened the constellation it to the island of Trinacria (now called Sicily) which has a somewhat triangular shape. Triangulum is surrounded by Andromeda to the north and west, Pisces to the southwest, Aries to the south, and Perseus to the northeast. Beta Trianguli, the brightest star, is a spectroscopic binary star about 127 light years away. Alpha (α) Trianguli, also called Mothallah, which is Arabic for triangle, also has a close companion detectable only through their spectra. Gamma (γ) Trianguli is a whitish main sequence star. It makes an excellent optical triple star for binoculars along with delta Trianguli and 7 Trianguli. The stars are not physically associated. Figure 2 - The open star cluster NGC 752 imaged through a telescope. Credit: Roberto Mura/Wikipedia Commons. While often overlooked for Andromeda, Perseus, and other larger constellations in the autumn sky, Triangulum offers a few fine deep-sky objects for observers with a small telescope. Iota (ι) Trianguli is a fine double star with a yellow and blue component separated by a little less than 4". It makes for good viewing at 100x or more in nearly any telescope. Each component is itself a tightly-spaced and unresolvable double star, which means iota Tri is a four-star system. The stars is sometimes cataloged as 6 Trianguli. And there's NGC 752, a pleasant star cluster often overlooked for more famous deep sky sights in this part of sky. The cluster is easily visible to the unaided eye in clear and dark sky a little less than halfway between the 3rd-magnitude beta (β) Trianguli and 4th-magnitude upsilon (υ) Andromedae. NGC 752 is a somewhat sprawling cluster, ideal for 3" to 4" scopes at low magnification. Use an eyepiece that takes ina wide field of view, at least 1 degree. At 50x, the cluster reveals 70-90 faint stars spread over 40'. Many stars within the cluster are yellow and orange, which implies the bright blue and white stars have long ago burned out. Indeed NGC 752 is more than 2 billion years old, a very great age for an open star cluster. The cluster lacks a well-defined central region or outer boundaries. This is another common feature of older clusters, as many of its constituent stars have been stripped away by gravitational interaction with other stars and molecular clouds. Near the center of NGC 752, look for an orange 7th magnitude star in a tight triangle with two fainter stars. The orange star is likely not related to the cluster. Less than half a degree southwest of the cluster, look for a pair of 6th-magnitude stars with orange and gold hues (see Figure 2). Figure 3 - The Triangulum Galaxy, M33. The emission nebula NGC 604 is at upper left. Credit: Jschulman555/Wikipedia Commons. The jewel of Triangulum is the small spiral galaxy M33, the second-closest spiral galaxyafter the Andromeda Galaxy, M31. Part of our own Local Group of galaxies, M33 is about 1/15 the mass of the Andromeda Galaxy, and it may be a distant satellite of M31. 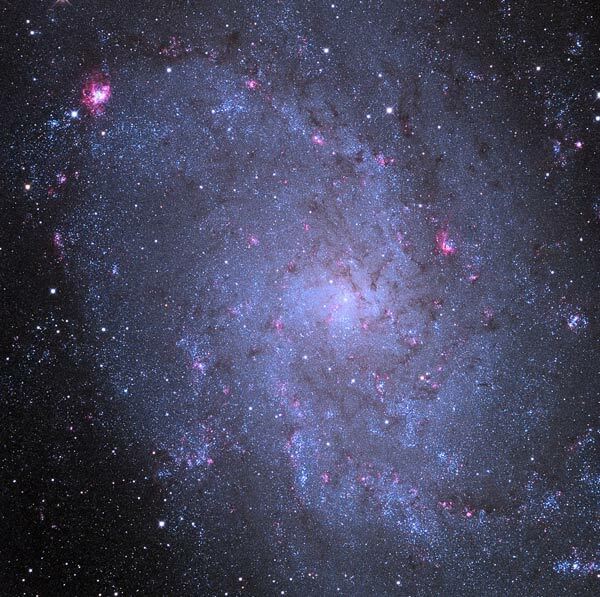 Often called the Triangulum Galaxy, in photographs M33 is lovely as a lotus-blossom and rich with new blue stars and pink nebulae along its spiral arms. It is a challenging object for visual observers, however, but still worthy of careful inspection in a small telescope in dark skies. M33 is listed as magnitude 5.7, so you may think it's bright enough to see easily in a telescope. It is not. Its brightness is spread over an area 4 times larger than the full moon, so M33 has a low surface brightness and is notoriously hard to find in light-polluted or moonlit sky. Some observers use M33 as a sky test: if you can see M33 with your naked eye, you have extremely dark and clear sky (and pretty good vision, too). The galaxy is 2.7 million light years away. That makes it is the farthest object visible without optical aid for most observers. To find this fine galaxy, slowly sweep the region about 4.5 degrees west-northwest of 3rd-magnitude alpha (α) Trianglulum. Use low power. Moving your scope or tapping on its side may help you see this faint galaxy. Stay with low magnification to take it all in. You may see some structure and mottling in the spiral arms with a 4" to 6" telescope. Higher magnification with an 8" to 12" telescope seems to dim the view somewhat, but often brings out more structure in the arms, especially the tiny knots of nebulosity of star-forming regions. The spiral arms of M33 are festooned with the pink glow of star-forming nebulae. 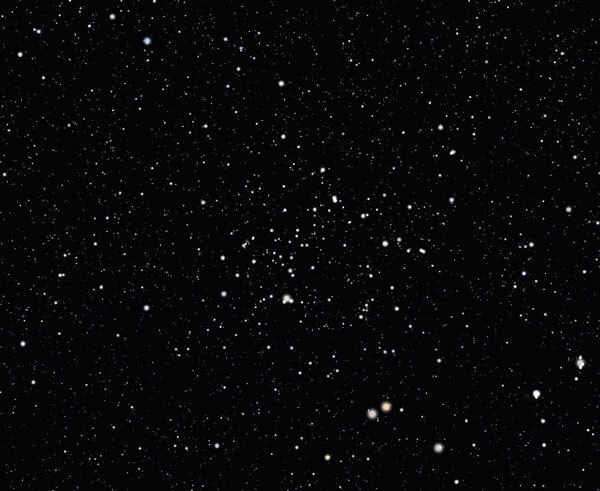 The largest such region, NGC 604, is visible in a 4" or larger telescope under good conditions. This is an amazing circumstance: to see a star-forming nebula in another galaxy with a small telescope from your own backyard. NGC 604 is visible as a tiny star-like region about 12' northeast of the nucleus of M33. A 10th-magnitude foreground star is just 1' to the southeast of the nebula. The star and the nebula look at first like a double star, but you will notice one of the stars will not come to a focus. That's the nebula. Pop in a nebula filter to improve the contrast of this extremely distant region of ionized gas and newly formed stars. NGC 604 is visible with a small telescope from such a great distance because it is amazingly large - about 100x the size of the Orion Nebula - and it is illuminated by more than 200 massive stars at its center. Seer, Gabby76 and Dave In Vermont like this.